One of our long-term clients that works in the construction industry recently approached us for a new project. 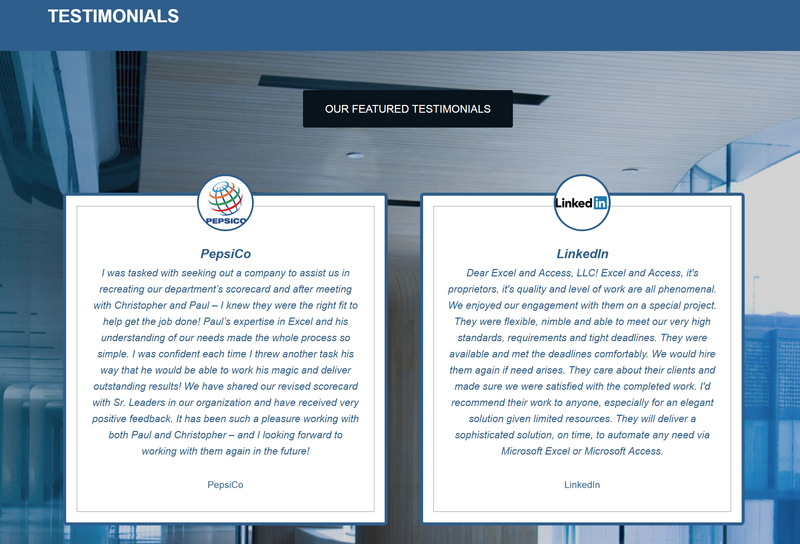 Like their other recent projects with us, this was to build a new Microsoft Excel file that would be fully automated, and also fully integrated with Microsoft Access. 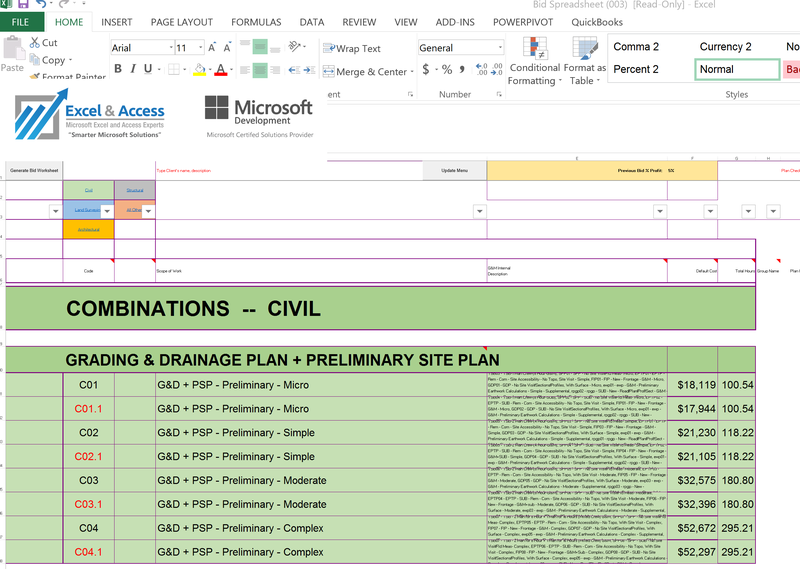 The purpose of the new Excel and Access solution was to allow their staff to quickly and accurately build estimates for quoted projects. Typically when we build such systems we make them as point and click friendly as possible, using macros/vba to automate the tasks and to integrate the file with other Microsoft applications such as Outlook. The custom graphical user interface makes this a point and click system. Shave hours or days off of the time taken to do such work with these files. We are the “Smarter Microsoft Solutions™” Provider. It is the caliber of our credentials that sets us apart from the majority of the competition; they just don’t have the chops we do, they have not been doing this long enough; they have no track record, our track record is 25 years of exceeding our clients expectations, hence the 5-Stars. The challenge is to fully understand every step the client takes when they work on a file. How much of that, if not all of that, can be automated. For instance, updating the monthly budget versus actuals can be accomplished with a single click of a command button on an Excel workbook. That will trigger all of the code that updates the file. It will even verify and distribute the files for you. The challenge is to automate and integrate as much as possible. That is where the client sees the benefits of the work. The benefits are in terms of a significant reduction in labor cost, amount of time used to update files, and the increased accuracy. Pay once for the development, benefit each time that you use the file. Do work that took days or hours down to seconds or minutes. Increase the accuracy of the work. Use this now free time to work on decision making versus data moving. The custom Microsoft Excel, Access and Power BI solutions that we create are based on our exacting needs for the proper solution. We build systems that get the job done quickly and efficiently. 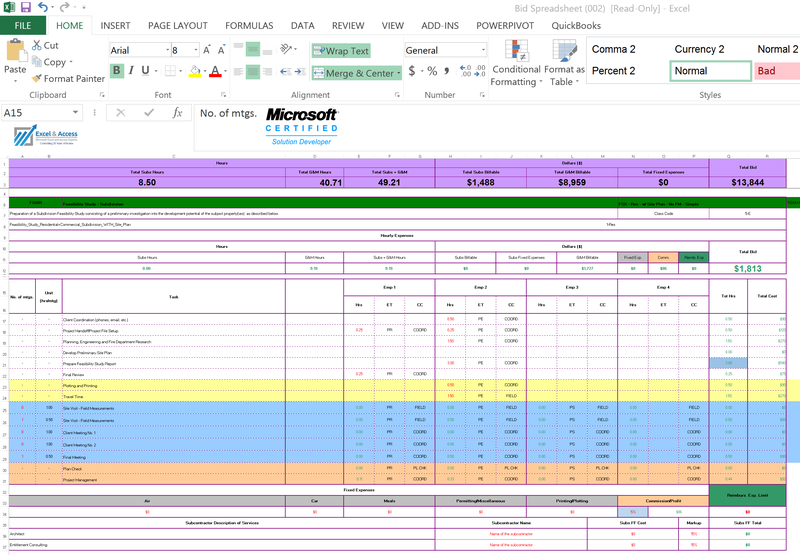 We use both Microsoft Excel UserForms (See below) as well as Microsoft Access Forms. From budgets, forecasts, actuals to month-end reporting and financial analysis. 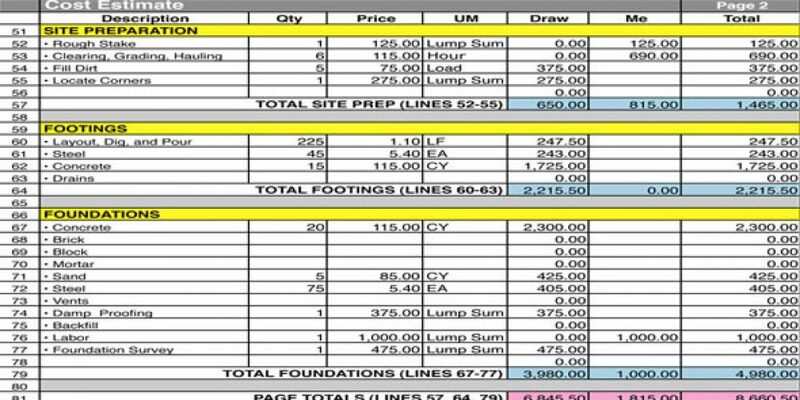 Estimating labor, construction materials, financials, etc. 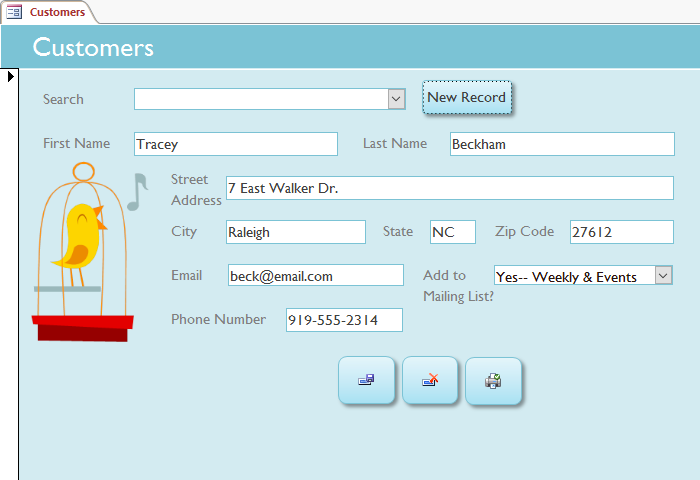 Create a custom graphical user interface using Microsoft Excel UserForms and/or Microsoft Access forms. Create a custom Windows app that integrates Microsoft Excel, Access, and SQL Server. Integrate any and all of the Microsoft Office applications, SQL Server, Azure, Power BI and .Net into one seamless application. 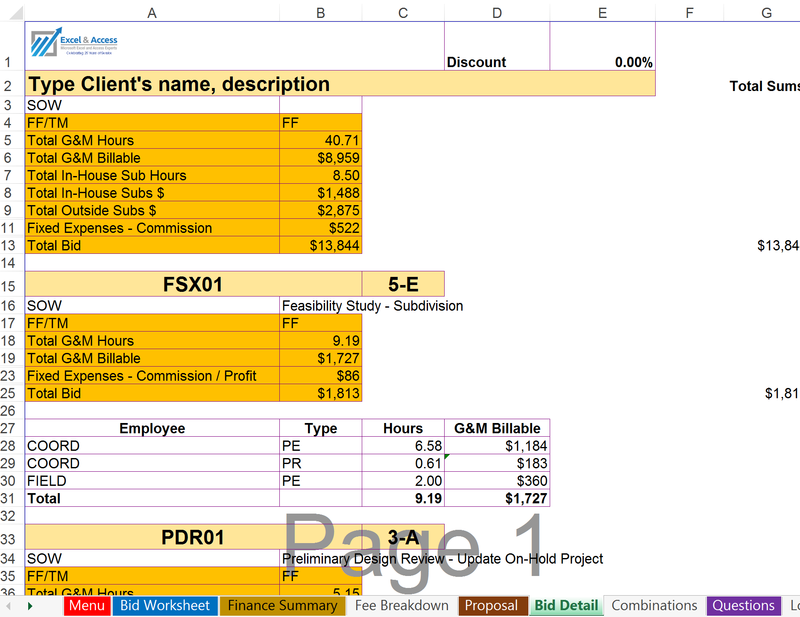 Integrate Excel with Word, Outlook, Power Point, etc, Windows and the Mac. Use powerful Microsoft Power BI Dashboards for your top KPIs. Integrate your Microsoft solutions with the web via Azure. Build systems that anyone can use, even from a different department, via point and click. Over the years hundreds of firms have taken the time to write a review on our services. We take great pride in the work that we do, as we do with the firms that hire us. What they say matters; it tells our tale. a Google 5-Star Rating, there is none higher. If your organization would like to receive Google Rated 5-Star Smarter Microsoft Solutions, dial 877-392-3539.